At Inspire, we officially released our first interactive IDC Microsoft Next-Gen Partner Marketing eBook which takes a deep dive into channel marketing industry trends as informed by the marketing practices from some of our most successful partners. This publication was a joint effort between IDC and Microsoft and wouldn’t be possible without the cooperation of our amazing partners. 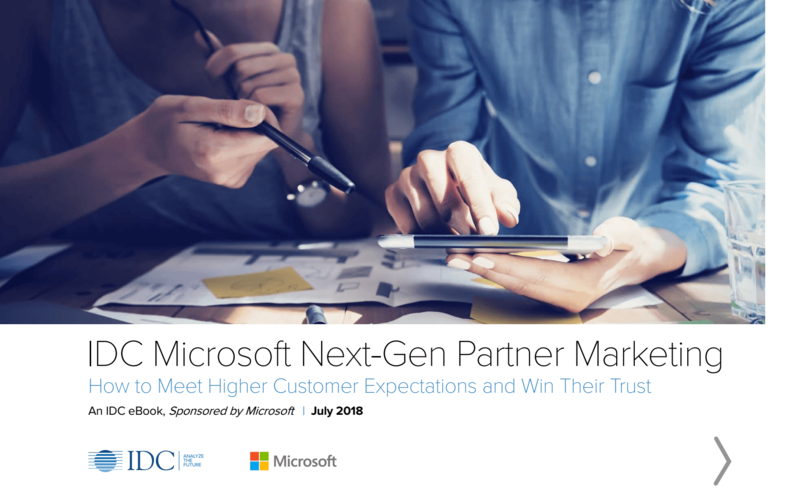 The IDC Microsoft Next-Gen Partner Marketing eBook was completed in June 2018, after a six month study of our partners marketing practices. The eBook presents IDC industry research combined with findings from interviews IDC conducted with seasoned marketers as a number of Microsoft partners around the world. The discussions covered the innovative work that our partners are doing to attract, serve and retain customers. This eBook is a great value-add to support partners envision a viable go to market strategy. It can serve as a benchmark guide for partners to understand the skills needed to compete for today’s customer. The information found inside was built by partners who are using marketing to drive growth in their businesses. This information was designed to help marketers think DIFFERENTLY about their role in the customer relationship as we compete in a world of constantly rising customer expectations. Partners will find many practical tips and successes in the eBook that they can implement right away. The eBook can be found in the Microsoft partner website here (scroll down to “Raising the bar in marketing”) and directly at aka.ms/smartmarketingebook.